Situated on a secluded, woodland camping resort full of amenities, facilities, and services for enjoying the great outdoors, this luxurious tent is located near Massasauga Provincial Park, Ontario, and can accommodate two guests in a space that combines comfort, rustic furnishings, and a sense of peaceful harmony with the tent's natural surroundings. Inside the tent, guests will find two single beds that were handcrafted with live-edge slab lumber. Here, guests can enjoy a comfortable night's sleep atop high-density CertiPur foam mattresses that come replete with luxurious sheets, fleece blankets, quilts, and hypoallergenic pillows. The interior of the tent also features live-edge wooden benches and shelving for guests' belongings. Other amenities include three hanging solar lights: one above each bed and one at the tent's entrance. The solar battery that powers these lamps also provides guests with a USB port with which they can charge their phones. Outside, guests will find a rain-tarp-covered porch with a pair of deck chairs to relax on, rain or shine. Guests will also have access to two outdoor showers that are lined with cedar and provide propane-powered, on-demand hot water, with complimentary natural body wash and shampoo provided. 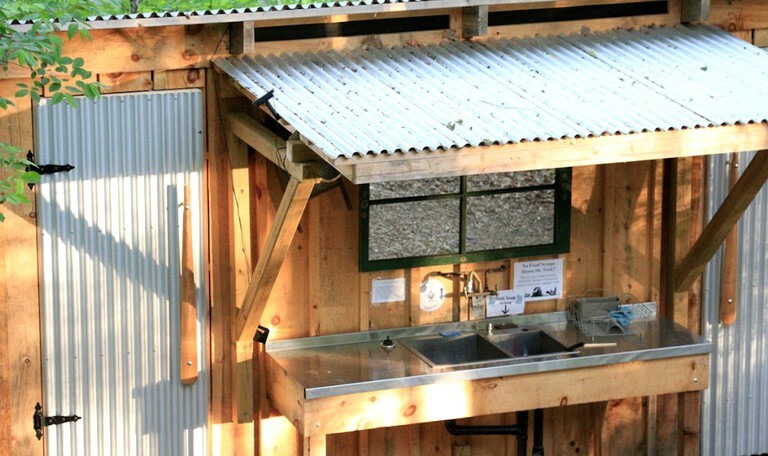 They will also find an environmentally friendly, practically odor-free composting outhouse behind their tent. This site provides guests with a range of facilities and amenities to help them meet their needs, relax, and enjoy the great outdoors. At the 600-square-foot, covered and screened pavilion, guests can cook in a fully-equipped kitchen, dine, access high-speed Wi-Fi, charge their devices at multiple outlets, and enjoy each other's company with the site's collection of games. The kitchen facilities include a barbecue grill, two propane stoves, a full-size fridge, a microwave, complimentary coffee and tea, and a full range of pots, pans, cooking utensils, eating utensils, and dinnerware. 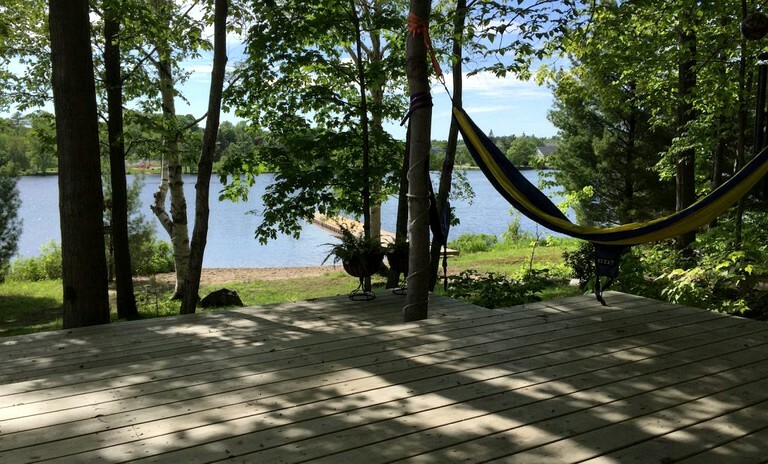 At the spacious waterfront deck, they can enjoy daily yoga classes in the morning or rest on its Muskoka chairs in the afternoons and evenings. They can also kick back and relax in the hammocks strung up in the surrounding trees. At night, they can gather around the cozy communal fire pit. 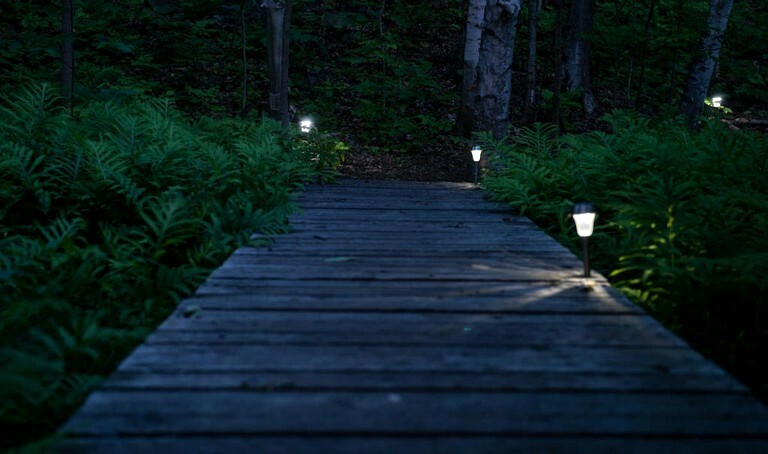 Solar lights help guide guests around the site's trails, one of which leads to the site's Mill Lake waterfront, where they will find a feeding spot for waterfowl and a bench to take in the view. 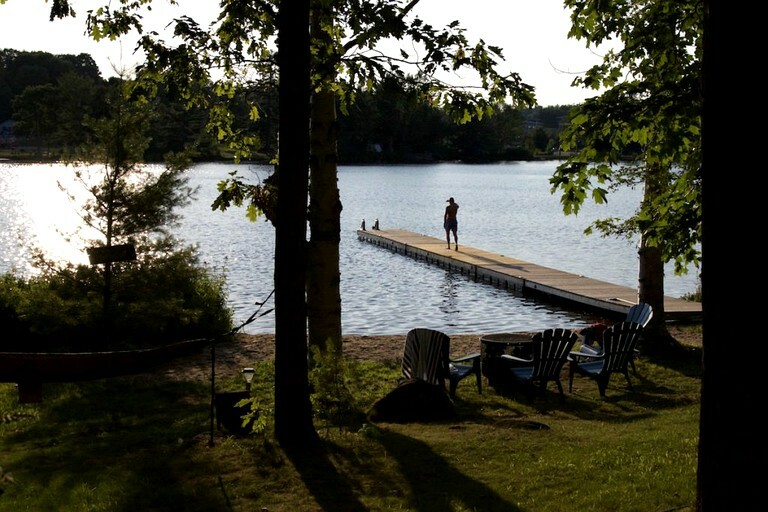 Along the lake, guests will also find a dock and a sandy beach for swimming. In the winter, the lake provides guests with a rink on which they can go ice skating, and the surrounding land provides trails on which they can go snowshoeing. For further enjoyment of the water and surrounding land, guests will have access to a canoe, a kayak, a stand-up paddleboard, a mountain bike, a cycling bike, fat bike rentals, lessons, and guided tours. 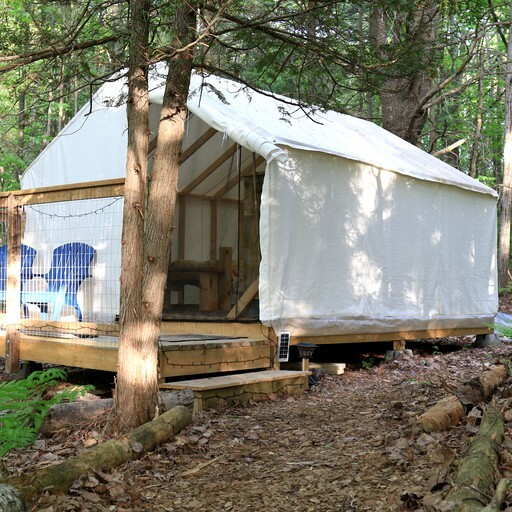 Guests staying in glamping tents will enjoy two outdoor showers that are lined with cedar and provide propane-powered, on-demand hot water, with complimentary natural body wash and shampoo provided. They will also find an environmentally friendly, practically odor-free outhouse behind their tent. Bed and breakfast guests will enjoy modern, luxurious bathrooms that provide guests with heated tile floors and custom-built, glassed-in showers equipped with dual rain shower heads. They will also enjoy daily housekeeping, high-speed Wi-Fi access throughout the bed and breakfast, a great room in which guests can enjoy views of a woodland ravine through which deer sometimes stroll, and a dining room in which a complimentary breakfast is served every morning. The breakfast consists of fresh-ground coffee, a variety of teas, homemade granola with fresh fruit and yogurt, scones or fresh bread with locally-made jam, and a home-cooked main course that varies every day, such as poached eggs with smoked salmon, pumpkin waffles, or cheddar and mushroom quiche. The host can cater to guests' dietary needs and preferences. Bed and breakfast guests will also have access to all of the outdoor facilities, amenities, and services described above. Kayak and stand-up paddleboard rentals and lessons are available right from the site. Canoes are available to rent as well. Guests can also go on a guided kayaking day trip in Georgia Bay (gourmet lunch included) and a stand-up paddleboarding tour of Parry Sound in the evening. Mountain bike, road bike, fat bike rentals, and trail passes can be arranged and delivered to the site through one of the host's partner companies. Nestled within a secluded, woodland environment near the shores of Mill Lake, this glamping site is located in Parry Sound, Ontario, which is part of the Georgian Bay of northeastern Lake Huron, an expansive, largely land-enclosed bay that is sometimes called Canada's "sixth great lake" and boasts 1,240 miles of rugged, pink-grey granite-strewn shoreline and 30,000 pine tree-filled islands, comprising the largest freshwater archipelago in the world. Parry Sound, in turn, features numerous smaller bays and islands, with a treasure trove of lakes and forests inland. These, in turn, provide habitats for a variety of plants and wildlife, including broad beech ferns, monarch butterflies, lake sturgeons, five-lined skinks, spotted turtles, Massasauga rattlesnakes, bald eagles, eastern wolves, and 27 other at-risk species. Among the many natural attractions in the area are Oastler Lake Provincial Park and Massasauga Provincial Park. At the former, guests will find the Boyne River and panoramic views overlooking Oastler Lake, while the latter encompasses hundreds of islands, lakes, and forests that are home to beavers, moose, grouses, deer, and bears. It also provides a sanctuary for Massasauga rattlesnakes. Even more natural splendor can be found at Killbear Provincial Park, which features sandy beaches, rocky ridges, pine forests, and wetlands. All three parks provide ample opportunities for outdoor activity and enjoyment of nature. Guests can enjoy a variety of outdoor activity options right at the site. In the summer, they can go kayaking, canoeing, and stand-up paddle boarding on Mill Lake, with rentals and lessons available from the site's private waterfront dock. Guests can also go on a guided kayaking day trip to explore the Georgian Bay, with gourmet lunches provided to them along the way, and a guided stand-up paddleboarding tour of Parry Sound in the evening. In the winter, guests can go snowshoeing on the site's trails and ice skating on its waterfront rink. At the site, guests will also find a sandy beach where they can swim, a pavilion where they can cook and dine, a waterfront area where they can watch the waterfowl, hammocks in which they can kick back and relax, and fire pits around which they can enjoy each other's company in the warm, cozy glow of a crackling fire. Guests interested in practicing yoga during their stay can enjoy daily yoga classes held on the site's spacious waterfront deck. For cycling and mountain biking, guests can rent mountain bikes, road bikes, and fat bikes from Parry Sound Bikes, which can deliver bikes and trail passes to guests right at the site. From there, they can go biking along the Parry Sound waterfront, the Rose Point Trail, and the trails of the Georgian Nordic Activity Center. At the latter, guests can also go cross-country skiing in the winter. At nearby Oastler Lake Provincial Park, guests can go canoeing, swimming, and fishing for bass, pike, and rainbow trout. They can also go hiking and biking on the Seguin Recreational Trail, which is just five kilometers from the park. At the Massasauga Provincial Park, guests will find even more opportunities for kayaking, canoeing, fishing, and boating, as well as three hiking trails, one of which, the Moon Island Trail, winds through varieties of terrains and types of forests, with vistas of Georgian Bay, a beaver pond, heron rookery, and an abundance of waterfowl to be seen along the way. For dining, shopping, art galleries, and spa visits, guests will find a variety of options in the town of Parry Sound, where they can also visit the West Parry Sound District Museum and attend performances at the Charles W Stockey Centre for the Performing Arts and the Festival of Sound Chamber music festival. Smoking is not permitted at the site. If guests need to smoke, they can do so in the site's lower parking lot. Pets are not permitted. The host can connect guests to local kennels. Children under the age of 13 are not permitted to stay overnight due to safety concerns (the site contains rough terrain and unsupervised waterfront areas). If guests are having family gatherings at the site, however, children can visit during the day.